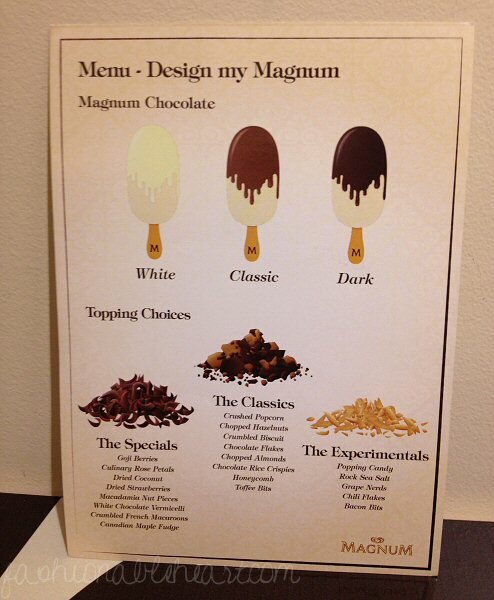 My husband and I went to the pop-up Magnum ice cream store downtown on Saturday and it was a blast! If you are going to be near Toronto, you should really check it out. Hurry though, because it closes its doors this Friday on August 30th. These are popping up in big cities, so be on the lookout to see if a Pleasure Store is opening near you! 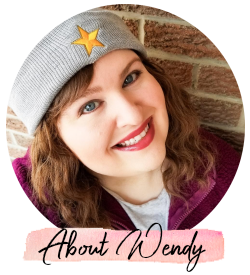 In this post, I'll show you some of the pictures I took, what I ordered, and what I thought of it. ^ The Toronto store is located on 11 Bloor St. W in the Yorkville area. It is not hard to find at all, which says a lot because I am extremely directionally challenged when downtown! ^ It's all in the details! 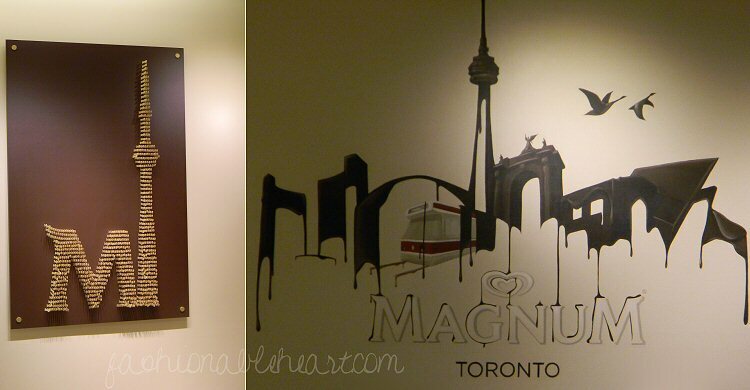 The Magnum and CN Tower art is made out of Magnum's sticks. Amazing artwork inside! ^ The toppings all spread out! Over 20 to choose from. The possibilities are nearly endless! 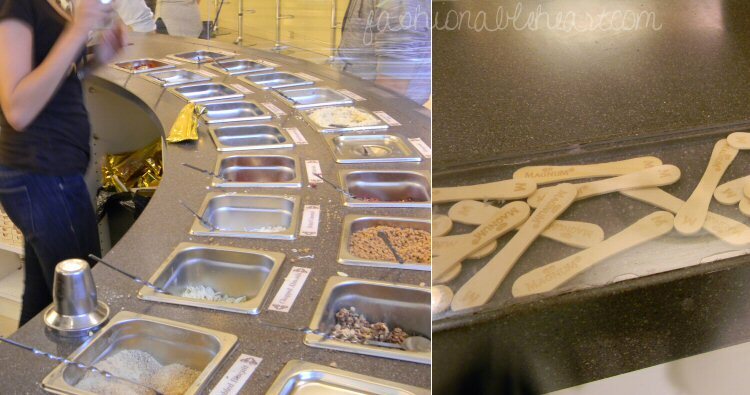 And again with the details, they put a barrier around the counter and decorated it with the Magnum sticks. It looked really cool from afar. ^ You can choose between vanilla and chocolate ice cream, choose the chocolate coating, unlimited toppings, and a chocolate drizzle of your choice. They recommend only choosing 3-5 so that you can taste everything, and I would say that is a worthy assessment. I got four and could taste them all, but I think anymore toppings would have been lost in the mix! ^ This was mine! I went with vanilla ice cream. They did not have enough white chocolate left to coat the bars, so I went with milk chocolate. My toppings were macadamia nuts, hazelnuts, toffee bits, and crushed macarons with a chocolate drizzle. I also asked for the "gold touch" which is not on the menu, but it is fun edible gold flakes. 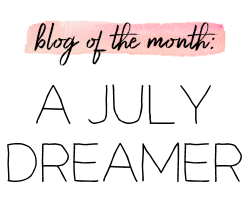 Just for a little girlish flair! ;) My bar was perfect! ^ My husband's! 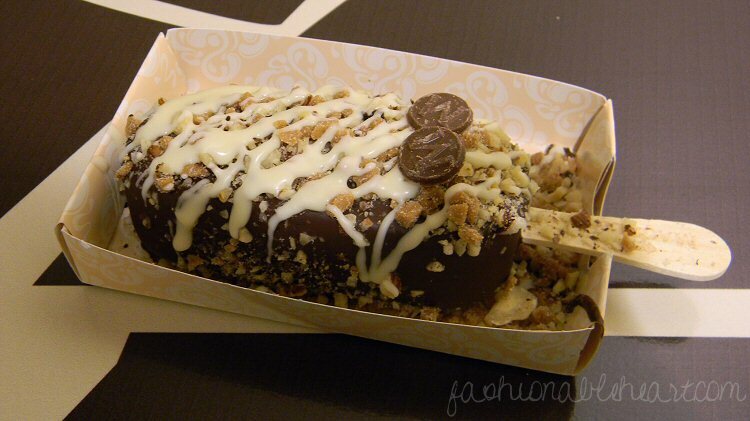 He did chocolate ice cream, milk chocolate coating, macadamia nuts, hazelnuts, toffee bits, and a white chocolate drizzle. He said how much he loved the little "M" chocolate discs they were putting on the bars, so they gave him an extra one. How cute is that?! The bars are $6, including tax. A little steep? Yes, but a fun novelty that is worth indulging in! 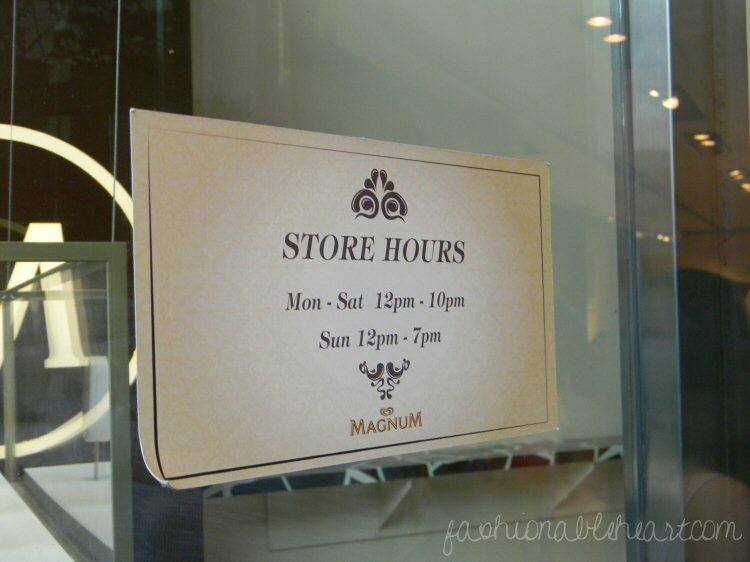 Magnum is a luxury ice cream brand, so it being an indulgence is expected. We arrived around 6:30pm and waited in line for maybe a little over 30 minutes. The line was a lot longer when we left. I think we played it smart, because we went while the crowds were out having dinner. The ladies working there were so sweet. One stood outside to show the menu and keep the line moving and she answered everyone's questions so politely and spoke about some of the toppings and which went well together. And when inside, the line moved quickly and diligently. There were several workers taking orders and working quickly, while not rushing the customer at all. Customer service was not lacking by any means. 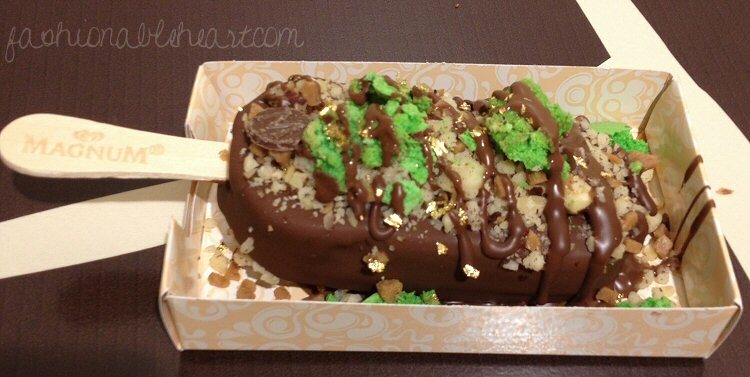 I walked away with my $6 ice cream bar, a smile on my face, and an experience that was one-of-a-kind. I really thought this was going to be a review of an adult toy store, based on the title. I much prefer it for ice cream though! @Blush and Barbells - Right?! A very cheeky name on their part! 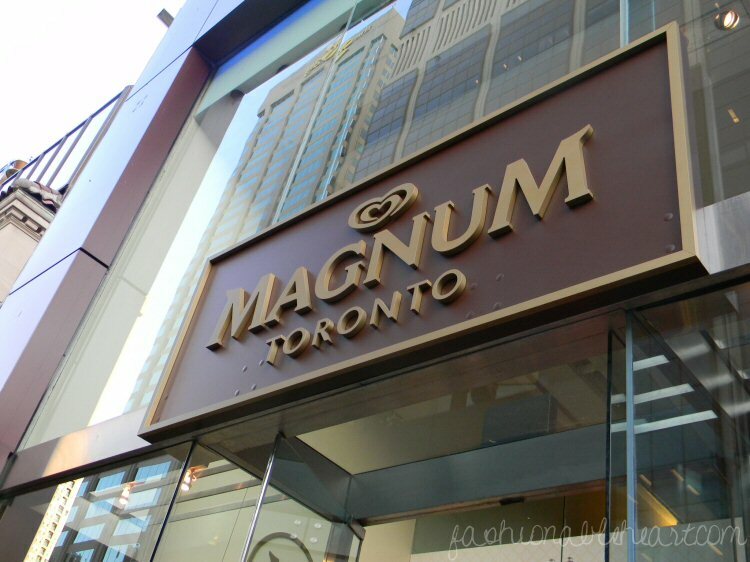 I went to the Magnum store in Toronto recently too and asked for the 'gold touch'! The whole experience was so lavish--I wish it was a permanent store!